Christopher Noto started his career as a banker,Â but found the pull of interior designÂ tooÂ hard to resist.Â HisÂ work is influenced by Asian aestheticsÂ with a modern flair. Drawn to the craftsmanship and quality of an object, ChristopherÂ is launching his own furnitureÂ line. HereÂ he shares some of his personal items for sale. Passion. I started my career as a banker, but was spending a good deal of my free time on weekends at antique markets and design stores in NYC. When my position was transferred to Asia, I developed a taste for Asian art, furniture, and artifacts. After leaving the bank, I built a house in Bali and met many people in the business, eventually opening a furniture store in Singapore. My first store was located on the same street as Aman Resorts/GHM, and they ended up becoming one of my largest clients. I was able to design and supply furniture, art, objects, and accessories to many of their projects around the world, such as the Setai in Miami (together with Jaya Ibrahim), Amanyara in Turks and Caicos, and the Aman Summer Palace in Beijing. Recently I have launched a furniture collection www.elanatelier.com, which is sold through various stores in the U.S. The pieces are very high quality, made with noble materials such as lost-wax bronze, parchment, and shagreen. The craftsmanship and quality of an object is extremely appealing to me. Nowadays, there are a lot of lookalikes on the market, but they don’t hold up to scrutiny. There is no replacement for fine craftsmanship and high-quality materials. 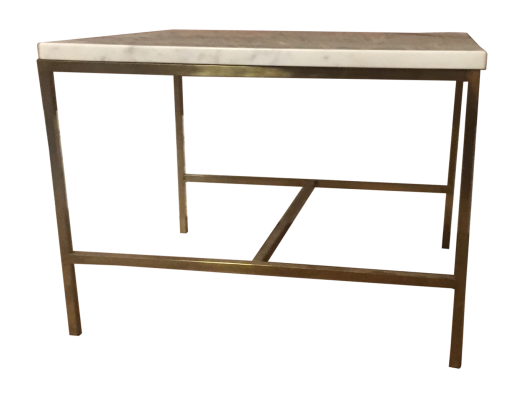 A few of my furniture designs, sold through Elan Atelier in the U.S.
Tournant dining table. Ivoire sideboard with bronze handles, parchment doors, and faux ivory finished edge in carved gesso. What is your go-to source for inspiration? I’m inspired by people and places/travel. In different ways, I am inspired being in nature and in cities. Paris and NYC both provide ample smorgasbords of inspiration any day of the year. I’m inspired by people, places, and objects. I feel an emotional response looking at the purity and elegance of form in a piece of Ming Dynasty Chinese furniture. This leads me to strive for more simplicity in my designs. However, I am equally inspired by the lush richness of Orientalist art or a Dutch Master painting. My creative process is massaged by a desire to find the mid-point of these seemingly diametric opposites. There is a beautiful tension in East/West, Male/Female, Old/New, Ugly/Beautiful, and often, just a sensitive curation of these seemingly opposing aspects is what creates a beautiful result. I have spent nearly half of my life in the U.S., and the other half in Europe and Asia. This mix is reflected in my personalÂ spaces; Paris is more highlighted on the European side, and New York, more on theÂ American side. There is a strong sense of place in both cities, and I like to reflect this energy in interiors. Having recently located to New York, I’m newly inspired by mid-century artists such as Paul McCobb, whom I think would share my affinity in Ming furniture. His style is so simple and elegant, much like a Ming piece of furniture, but also of our modern time (which arguably found its footing in the 1950s). To me that is very inspirational. I found this vintage 1960s Italian chandelier in an antique market in Paris, and I am now producing a similar version for my furniture collection with Elan. A comfortable, curated, evolving, global mix. I am lucky to be working on a few dream projects presently, including a chateau in France, and houses in London, Hong Kong, and Singapore. I look forward to doing more projects in NYC and surrounding areas, now that I am based here. I have a weak spot for historical buildings and spaces that require some TLC to restore their glory and bring them back to life. What’s a staple in your tool kit? My iPhone. I’m very visual, so I’ve taken to snapping photos whenever an object of a place inspires an emotional response. Who do you look up to in the design world? The late Jaya Ibrahim (whom I was fortunate to work closely with for several years), Peter Marino, Miles Redd, Ed Tuttle. I don’t regularly seek out any one platform or magazine, as inspiration might strike anywhere and everywhere. I love the museums in NYC and Paris. The Carre des antiquaires and the Marché aux Puces have wonderful finds.Â I also love photography and art, design, and even some fashion magazines such as Elle Decor, AD, Veranda, World of Interiors, and The Rake magazine. What inspired you to consign your items with Viyet? I found some great pieces on Viyet myself, and I appreciate the curated approach. What piece is most important to you â€” and why? I love the Paul McCobb pieces as they embody quality, craftsmanship, and purity of form. I very much appreciate the curated approach of high-quality items.